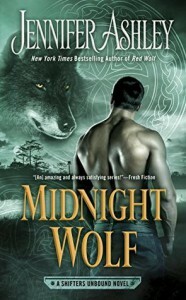 It has its own plot - nobody trying to take over the shifters, nobody getting sucked into Fairy, and while there is a bad guy, he's only present a few times. The h is a fox shifter. Her ancestors were created by some of Lady Aisling's people, and were gifted with magic. She's managed to elude the shifter bureau for years. Someone enlightened them to her existence though and they want her for various reasons. They force the H to capture her, but things go awry there so she, the H, and his kid spend an extended period of time hiding and running.